EDGE OF PARADISE Release Official Video For "Alive"
Hard Rock/ Heavy Metal band EDGE OF PARADISE has released the Official Music Video for "Alive" off of their upcoming EP. 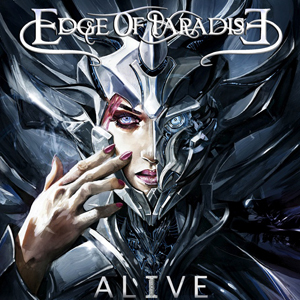 Directed by Val Rassi, "Alive" is taken from EDGE OF PARADISE's upcoming release of the same name. A 5 song EP produced by Chuck Johnson (KORN, SLIPKNOT) and mixed by Jay Ruston (ANTHRAX, POP EVIL), Mike Plotnikoff, and Michael Wagener, Alive is due out 3/10 via ILS/Universal! Front woman, Margarita Monet, states "This song is extremely contagious, with the heavy hitting/ industrial beat, and a chorus that'll get your blood pumping!" Check out the video now on KNAC.COM right HERE. "Alive is dealing with us humans being so caught up in the digital world, obsessed with convenience and monetary gain, we have begun to sacrifice our humanity. We are becoming corporate led consumer machines! We get lost in the enticing virtual reality that we forget what real human interaction feels like. Sometimes I want to break away from bombardment of advertisements, social standards, never ending race with time and just breathe, and remember what it's like to feel alive! To connect with our fellow humans and the world! Production wise, the band is exploring it's heavier side, with the new industrial edge, yet keeping the band's dynamic and melodic sound! “This is our best music to date! We were so fortunate to work with amazing, powerhouse people on this CD, and are confident that the outcome is the most exciting EDGE OF PARADISE musical experience yet!" "We are working with a great team of people and are excited to bring our show to you and meet all of you awesome music fans out there!" EDGE OF PARADISE will be having exciting giveaways during the months of Feb and March, keep posted on their Facebook page HERE. EDGE OF PARADISE was formed by Margarita Monet and Dave Bates in 2011. Few months after formation, the band released their debut album Mask that featured rhythm section of bassist Tony Franklin (BLUE MURDER, THE FIRM) and drummer Gregg Bissonette (DAVID LEE ROTH BAND). Mask came out at #6 most added on national CMJ radio, right behind MACHINE HEAD and solidified existence of EDGE OF PARADISE.